Pecos Bill Tall Tale Inn and Cafe is filled with the stuff of legend. I’m not being whimsical here, there are artifacts and tools of the trade hanging upon the walls from not only Pecos Bill himself, but Davy Crockett, Kit Carson, Jim Bowie and a host of others. Many of these pieces have been presented to Pecos Bill by friends and adventurers who have passed through is sleepy corner of the Magic Kingdom. 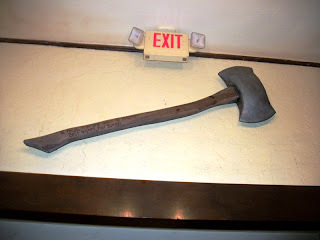 Such as this ax, hanging high near the rafters of the ordering stations and fixin’s bar. 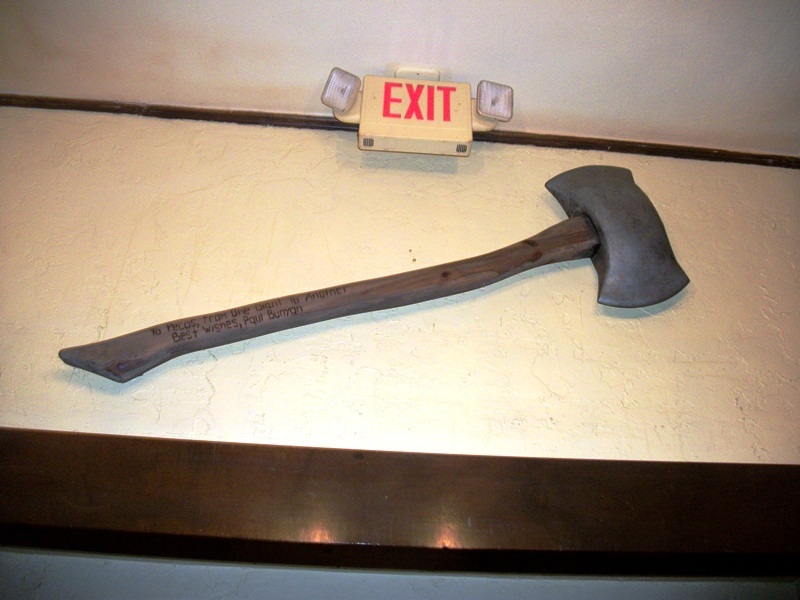 While meandering through the restaurant, you may notice that each of the characters represented have a tie to Disney’s film and animated history, and Paul Bunyan is no exception. A short about the life and times of Paul Bunyan, and titled after the colossus himself, was released in 1958. Paul was voiced by the incomparable Thurl Ravenscroft and the narrative was told by the Disneyland musical act The Mellomen. The short highlights a few of Paul Bunyan’s, shall we say, taller tales and includes the story of how he met Babe, the Blue Ox. I suppose Paul has given up his lumberjacking ways if he gave his ax to Pecos. Of course, the ax could be seen as fair compensation considering how much it would take to satisfy the hunger of a giant who is 63 ax handles high. Would love to see more photos of Pecos Bill's; I've never been inside, but it's on my top to-do list for my next trip. Paul Bunyan is one of my favorite Disney short films; it was great to see it turn up on the Rarities treasures DVD. Great song, too -- I wish there was some kind of compilation mix available for listening. This is such an absolutely awesome detail, and I've never even noticed it!